I enjoyed this report from a road-trip Michigan farmers recently took to Australia, to survey the agricultural system there. The American farmers took one look at a REAL market economy and got a palpable case of culture shock. "The government philosophy there is not for Australian farms to produce for the domestic market but for the export market, and for the domestic market to pay the cost," said Wood, a Sanilac County dairy farmer. "So instead of taking tax dollars like the United States does to support agriculture, money is taken from consumers directly via food processors and retailers...."
While the Australian philosophy runs counter to the U.S. farm bill purpose of providing "farm security and rural investment," it's not illegal. "Right or wrong, the philosophy is compliant with the World Trade Organization (WTO)," said Wood. Tour-goers also discovered that Australian farmers indirectly benefit from a national health care system, so they save on insurance expenses for their families and their farm employees. In addition, the group found several incidences where the island country's phytosanitary standards were more stringent than WTO minimums, allowing the country to legally ban imports under the guise of "health concerns." What a discovery! Those Australians save on insurance expenses for their families. Oh, no! Not their farm employees, too! And that's pretty sneaky of them to maintain sanitary standards above the minimum. We wouldn't permit it here. An earlier post in U.S. Food Policy linked to the Boston Globe's article on the cost of a healthy diet. A new study from Karen Jetter and Diana Cassady at UC Davis went into Los Angeles and Sacramento grocery stores to measure the availability of healthy food choices, the price of a market basket of healthy groceries (whole wheat breads and pastas, skinless chickens, lowfat milk, etc. ), and the price of a comparison market basket based on USDA's Thrifty Food Plan (TFP). Our results show that most people had access to healthier foods, though there was sporadic availability of some healthier items in lower-income neighborhoods. The healthier market basket was more expensive by about $32 to $41 due to higher costs of whole grains, lean ground beef, and skinless poultry. This higher cost is equal to about 35 percent to 40 percent of low-income consumers’ food budgets. The results on availability of healthy food were interesting, considering the high degree of concern about supermarket access. Supermarket access in the United States is highly variable from place to place. I sometimes refer people to USDA research showing that even most low-income Americans in this country have access to nearby supermarkets, but I have found this observation tends to annoy people who are familiar with a particular low-income community in which access is lacking. In my home town of Washington, D.C., for example, we had fine access to supermarkets in the neighborhoods of Columbia Heights and 14th Street, but in another high-poverty neighborhood across the Anacostia River, access was lacking. To somebody from Anacostia, it might be little comfort that supermarket access is pretty good for the average low-income family in the DC Metro area. As for cost, the new study found that whole wheat pastas were more expensive than regular pastas. Lowfat milk was a little less expensive than whole milk, and ordinary potatoes were less expensive than the french fries that were classified as less healthy. This fits my family's experience. There is a price premium for any packaged food marketed as healthy, but many healthy alternatives to expensive conventional foods are actually less expensive. Taking protein sources, for example, consider the costs of meats versus legumes. Overall, the Davis study's "healthy" market basket, including packaged food marketed as healthy, was more expensive than the conventional Thrifty Food Plan. 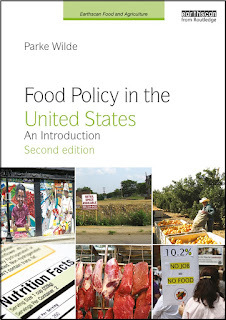 As a profession, agricultural economists have been leaders in studying food safety policy. Here is the new book, Toward Safer Food, by Sandra Hoffman and Michael Taylor. It starts the heavy lifting in building a scientific framework for studying food safety risks, along the lines called for by the National Academy of Sciences in an earlier report. Policy makers within the US Department of Agriculture (USDA) complement the role of meat and poultry plant managers in food recalls. The increasing frequency and scale of recalls raise questions whether sufficient attention is placed on these events. Three measures of recall effectiveness are introduced to evaluate this public-private crisis management process. Managerial and technical variables are compared to these measures of effectiveness. Results from regression models suggest that recalls carried out by the smallest sized plants, those that took place after Pathogen Reduction/Hazard Analysis Critical Control Point implementation, and recalls involving processed products are more effective. Little evidence of differences was found in the effectiveness of the crisis management process between meat plants compared with poultry plants or for plants that are part of a larger firm. A scholarly study of food safety crisis management may be just what a business executive needs on a week when something REALLY gross happens. On that story, see also Effect Measure. What happens if the Supreme Court kicks out the beef checkoff? Mike Barnett, editor of Texas Agriculture, covered the upcoming Supreme Court decision on the constitutionality of the beef checkoff. If the beef checkoff is overturned, other USDA-sponsored checkoff programs may also be invalidated in cases that take the beef decision as a precedent. However, Texas and several other states are enacting preemptive legislation that may establish state-sponsored checkoff programs fairly quickly in the event of an unfavorable Supreme Court decision. "Nobody knows," [Dallas attorney Will] Ellerman said. "It's a very divided court in a number of ways. I expect them to be divided. The fact that the court has even heard this case is significant." Ellerman says a ruling—expected this spring or early summer—will apply positively or negatively to the beef checkoff only. But a number of judges in other checkoff cases are waiting to see what the Supreme Court does before rendering decisions. "What those courts will do at that time, they'll take the opinion of the beef case and apply it to those cases and come to a result," Ellerman said. "I expect they'll apply it similarly to how the Supreme Court approaches it's opinion in the beef case." As a senior vice president for food giant ConAgra, Pat Verduin yesterday entered a potential lion's den -- a Harvard obesity symposium filled with health experts alarmed by Americans' eating habits. During the rare encounter between corporate food makers and some of their most stringent critics, she flashed a slide showing her firm's healthier brands, like Healthy Choice and Egg Beaters, but then sought to soften the crowd: ''We make Slim Jims. I'm going to be honest with you," said Verduin, to laughter. The symposium was funded through grants from McDonald's, Coca-Cola, Nestle, Dannon, and a number of other food makers. I have lately been reading Harvard epidemiologist Walter Willett's Eat, Drink, and Be Healthy. Sixteen states have passed laws protecting the fast food industry from consumer lawsuits for obesity and food-related illnesses, even if there were evidence of seller wrongdoing. Others are following quickly. I'm offering the reasonable reader the following debate, from which to try to discern the level-headed party. Experts say that these bills could make these companies completely unaccountable to the public. Mindy Kursban, executive director and general counsel for Physicians Committee for Responsible Medicine. “Questions regarding the role of the food industry in our nation’s obesity epidemic are just now being brought to light. Rather than immediately absolve the entire industry of all potential liability, we should learn more about how they have contributed to this public health crisis," she said. and even parents, no target is too big or small for these sharks who see dollar signs where the rest of us see dinner. Their strategy is clear: In order to woo a jury into dismissing any vestige of common sense, they have to shift the blame for America's allegedly burgeoning bellies away from a lack personal responsibility and onto those with the deepest pockets. If I were faced with a level-headed advocate for carefully crafted tort reform laws, the economist in me might be forced to acknowledge certain points. Lawsuits are not an ideal vehicle for progress on this issue. In an environment of adequate access to fast food ingredient and nutrition information, the sound economic point of view might favor relying on consumers to protect their own interests. But the same restaurant industry that is ramming these corporate shield laws down the public's throat, prematurely, is also trying to smoosh any effort to seek fast food restaurant labeling. I am sure you would rather see a good compromise on the table, as I would. But the bills being enacted now are a dreadful example of lawmaker obedience to big business commands rather than the public interest. You may want to check your own state's status and take action to make sure your state isn't next. Ha. With regard to pomegranates, the fine food weblogger at A Full Belly is too hard on herself: "Shame on me for not reading more carefully, perhaps pomegranates aren't all that." If there is any shame, I would lay it on the writer of the pomegranate sales piece, not the reader. And of course, there is nothing wrong with pomegranates, even if no fruit could possibly be all that was promised in the WebMD article. Forget the coffee or orange juice: A new study shows that pomegranate juice should be the beverage of choice to fight hardening of the arteries. Researchers found that pomegranate juice not only appears to prevent hardening of the arteries by reducing blood vessel damage, but the antioxidant-rich juice may also reverse the progression of this disease. The actual scientific article in the Proceedings of the National Academy of Sciences says nothing of the sort. In a study of 24 hypercholestremic mice, a dozen who were fed pomegranate juice had evidence of improved artery walls, compared to another dozen who received a placebo. There were also studies of human cells in a laboratory dish, which were exposed to "shear stress" to simulate high blood pressure. The last line of the WebMD article tells the true story: "However, large clinical trials using different antioxidants have yet to show that antioxidants can prevent heart attacks and other major heart-related events." The WebMD reporters don't mention that the study was funded by a grant from the Lynda and Stewart Resnick Revocable Trust. The Resnicks own the POM Wonderful company, for which one of the authors is a consultant. You may have seen POM Wonderful's poster advertisements touting the health benefits of pomegranates. I only noticed this story, because I remembered the names of the WebMD author, Jennifer Warner, and the WebMD person who reviewed the story, Michael Smith, MD. They were the same pair beside this story a year ago overselling the dairy weight loss claim. This claim has been taken up by the USDA-sponsored dairy checkoff advertising. The dairy article didn't mention that researcher Michael Zemel, quoted in the article, has a patent on the dairy weight loss claim. Such a patent seems odd enough in itself, and in any case it gives an awful strong economic incentive for future research to corroborate the existing conclusion. Okay, here's the clincher. Promo Magazine had this strange short article in September about a partnership between the National Dairy Council and WebMD. What exactly is their financial arrangement? Shouldn't WebMD acknowledge this partnership in articles on this topic? The Fact-esque weblog read the link to the recent report seeking a rough estimate of how the rise of obesity might affect life expectancy and hence social security and linked to NathanNewman.org to make a connection I hadn't noted. According to Newman, a GOP report highlighted the lower life expectancy of African Americans and Hispanic Americans and took this differential, not as something that should itself be remedied, but rather as an indication that these groups would especially benefit from the Administration's social security proposals. For the record, the response seems inconsistent with the tear sheet that I received from the Quiznos restaurant at Downtown Crossing in Boston. The tear sheet had "net calorie" information, indicating that somebody at Quiznos knows the nutritional profile. Here is the website for Quiznos' dominating competitor, Subway. It provides nutrition information for products of all types, and emphasizes a half-dozen sandwiches with particularly good nutritional profiles. Kudos to Subway. How on earth did the Beef Board and USDA come to work with Quiznos instead of Subway? Community Action to Change School Food Policy. The Massachusetts Public Health Association has put together a wonderful toolkit to help pass local policies to eliminate junk food and sodas from schools. It includes many top-notch resources, including sample policies, how to write a press release, arguments and responses (provided by CIFC), and much more. The toolkit also links local school policy efforts with Massachusetts’s statewide legislation re-filed this year to eliminate sweetened beverages and foods of minimal nutritional value from schools. Kudos to MPHA’s director of education, Roberta Friedman for her dedication and hard work on this project! To download the toolkit, visit: www.mphaweb.org/home_food_policy_kit.pdf. Framing the School Soda Debates. The Berkeley Media Studies Group has evaluated how recent debates on banning sodas in schools were framed in news coverage of the battles in the Oakland and Los Angeles Unified School Districts. How did proponents and opponents make their case? What statistics, metaphors, and values did they use? The findings can help advocates better state their position and anticipate their opposition's arguments. To download the report, visit: http://www.bmsg.org/content/Issue15.pdf. Countering Arguments for Sodas in Schools. To help support advocates who are fighting battles to get soda out of schools all over the country, CIFC has put together a list of common arguments along with suggested responses. You can access this document on the new section of our Resources page called, Taking on Industry: www.informedeating.org/resources.html. Will shortened life expectancy, caused by obesity, save social security? Good economics webloggers like Brad DeLong and political webloggers like Talking Points Memo have been focused intensely on the social security privatization debate. Obesity arises comparatively rarely. But here's a tie-in. A new report from the New England Journal of Medicine seeks to estimate how much life expectancy will be shortened due to the obesity epidemic. News reports say some experts think the authors' actual quantitative predictions are overly dire, but their direction is surely right. A major epidemic of life-shortening disease should probably be considered as part of official computations about when social security will go bankrupt. According to the AP coverage, the authors say obesity "likely will shorten the average life span of 77.6 years by at least two to five years. That's more than the impact of cancer or heart disease, said lead author S. Jay Olshansky, a longevity researcher at the University of Illinois at Chicago. This would reverse the mostly steady increase in American life expectancy that has occurred in the past two centuries and would have tremendous social and economic consequences that could even inadvertently help 'save' Social Security, Olshansky and colleagues contend." What is the nutrition profile of the USDA-supported Quiznos promotion? The Quiznos Steakhouse Beef Dip Sub features tender roast beef smothered in rich French onion sauce, and melted Swiss cheese, served in a toasted Quiznos roll, with a side of beefy, pan roasted au jus. For a limited time, the 6-inch sub sells for $2.99, and the 10-inch sub for $5.49. The Steakhouse Beef Dip is also available on Low Carb Toasty™ Flatbread. Now, I am against Big Brother, and am happy to let Quiznos choose its own ingredients. An informed consumer can then make his or her own choice about what food to eat. But, how can the consumer make an informed choice if Quiznos hides its nutrition profile? In the current public health environment, Quiznos should be ashamed, and its executives should lose sleep over this. And what about USDA and the checkoff board whose speech it claims as the federal government's own position? Is this the right product, the right company, and the right degree of nutritional transparency for a department that claims to deserve the mantle of leadership on federal nutrition guidance? Rebecca Blood found the GAO report on mad cow disease interesting. Sarpy Sam, a Montana rancher whose weblog I read, sent this article further explaining the interactions between the U.S. decision about Canadian beef imports and Japan's decision about the U.S. beef trade. According to the article, U.S. vigilance about Canadian beef imports may paradoxically make Japanese consumer groups even more nervous, by raising concerns about the North American beef supply more generally. Sarpy Sam must have guessed that I needed help explaining the matter, because I described it simply as a "complex calculation." The Oregonian newspaper included U.S. Food Policy in a roundup of food related weblogs. And the Public Health Advocacy Institute's weblog has been following our coverage of state-level anti-obesity initiatives. The Farm Policy weblog links to an NPR report about the controversy over reopening the Canadian border to beef imports, which had been stopped because of concern about mad cow disease. Some U.S. cattle producers oppose the reopening and have sued to stop it. In part, these producers may be seeking to protect American consumers. In part, they may be trying to protect themselves from competition with Canadian imports. And in part, they may be responding to a complex calculation about the trade implications simultaneously of Canadian-U.S. beef trade and U.S. beef exports to Japan, which has halted U.S. beef imports for a time, also because of concerns about mad cow disease. In case you believe U.S. policy-makers have the situation under control, the recent General Accounting Office report on enforcement of the firewall feed ban -- an important part of preventing the spread of this disease -- should cure you of your complacency. GAO says FDA has been misleading Congress about the effectiveness of this feed ban. See also this Reuters article (thanks to the Center for Media and Democracy). I just got back from colleague Christina Economos' inaugural talk as the New Balance chair for children's obesity research at my school, the Friedman School of Nutrition Science and Policy at Tufts. It was fabulous -- an inspiring mix of activism and scholarship. Christina's CDC-sponsored project Shape Up Somerville is a community-wide healthy living intervention, which recognizes that it is terribly difficult for an individual to make major lifestyle changes if the social networks around him or her are fighting those changes every step of the way. Progress may require addressing many social contexts at once, from homes to schools to the wider commercial culture. Speaking of the children's obesity, the main Friedman School seminar a week earlier was a fascinating talk by Juliet Schor, the author of Born to Buy: The Commercialized Child and the New Commercial Culture. Here is a review of that book by Tufts professor David Elkind. From Schor's account, it sounds like she was offered some sort of fellowship by the advertising industry to improve its image in the academic community. I don't think this offer had the desired effect. Her inside information on marketing food to children is devastating. Schor is also on the board of an interesting simple living advocacy group, New American Dream. That group's chief, Betsy Taylor, has recently released in paperback her book, What Kids Really Want that Money Can't Buy: Tips for Parenting in a Commercial World. The Economics Roundtable, organized by a University of North Carolina professor with the promising name of William Parke, summarizes the world of economics weblogs (including U.S. Food Policy). I have added it to my favorite weblogs in the sidebar. Check it out. Advertising to Children – Noting that children view an estimated 40,000 commercials each year, 50 percent of which advertise food products, California legislators enacted a resolution asking for responsible food and beverage marketing to children. Legislators found that studies show that food advertising and marketing result in more favorable attitudes, preferences and behaviors toward advertised products and that children’s food preferences are influenced by television food advertising. Availability of Nutritious Groceries – Studies show that living in communities without adequate access to supermarkets limits nutritious food choices and my contribute to long-term health problems, such as diabetes or heart disease, and diet-related deaths at a rate higher than the population as a whole. Pennsylvania legislators passed a resolution calling for a report on the shortage of supermarkets in urban and underserved areas. With bipartisan legislative sponsorship, an economic development program to bring more supermarkets into underserved communities has followed. Body Mass Index Measurement and Reporting to Parents – In 2003, Arkansas became the first state to require schools to annually provide parents with information about student body mass index as part of each student’s report card, including an explanation of possible health effects of body mass index, nutrition, and physical activity. Diabetes Screening and Management –Bills to require screening, risk analysis or testing of school children for diabetes were enacted in 2003 in California and Illinois, and introduced in New York. Noninvasive screening of school children is aimed at promoting an earlier response to prevent or respond to type 2 diabetes. Legislation aimed at improving care and diabetes management for children with diabetes in school or daycare settings was introduced in California, Illinois, Massachusetts, New Jersey, Pennsylvania, Tennessee, Vermont, and Virginia. Insurance Coverage for Obesity Prevention and Treatment – Legislation mandating health insurance coverage for obesity reduction treatments and prevention programs for children and adolescents was introduced in 2004 in Hawaii and Maryland. In addition, legislators in Hawaii requested the state auditor’s office to assess the social and financial effects of requiring health insurers to cover obesity reduction programs for children and adolescents. Nutrition Education – Legislators have taken a variety of approaches to encourage nutrition education for children, youth and parents, beginning with prenatal education and continuing through the school years. Many believe that with better information, children and their families will make better nutritional choices. Obesity Prevention and Education – States with legislative proposals calling for childhood obesity prevention or education initiatives included Hawaii, Illinois, and New York. Illinois considered a proposal to appropriate $500,000 for a grant to the Cook County Department of Public Health to establish a childhood obesity prevention education and awareness program, and a separate proposal for the state Department of Public Health to establish the same type of program for children and adolescents, especially for populations with high rates of obesity and obesity-related health complications. Legislation in New York would have established a Childhood Obesity Prevention program within the Department of Health to prevent and reduce childhood and adolescent obesity and created a fund for the program by taxing certain foods with minimal nutritional value and video sales or rentals. Physical Education or Physical Activity in Schools – Forty-eight states have some type of physical education requirement, but only Illinois currently requires daily physical education for school children and waivers can be granted. Recent proposed legislation has focused on refining or increasing physical education requirements or encouraging positive physical activity programs for students at recess or other opportunities for physical activity at school. Taxes on Certain Foods or Beverages with Minimal Nutritional Value – A New York bill introduced in 2003 (AB 9145) proposed an additional tax on certain food and drink items and on the sale or rental of video and computer games, commercials, and analog or digital video movies; and would have directed moneys from the tax to the Childhood Obesity Prevention Program Fund. Thanks to the Community Nutrition Institute for the link. Claire Atkinson of Advertising Age reports that Channel One's financial woes stem from the reluctance of Kellogg's and Kraft to advertise with the in-school commercial television news network. Channel One has been controversial, because it uses schools as a venue for advertising to a captive audience of children. Atkinson quotes the outgoing CEO Jim Ritts: "We took a big hit from Kellogg and Kraft." Parent company Primedia said, "The concern by certain advertisers about the obesity issue in schools caused them to stop or reduce advertising in schools." See Commercial Alert for the full story. In a second news item, the Federal Trade Commission has denied a request by Commercial Alert to require television shows to identify product placements, the practice in which the producers are paid to display commercial products. However, the most interesting thing about the FTC's letter to Commercial Alert is how weakly it defends product placement. It says the product placements may mislead consumers. Plus, it essentially lays out a research agenda, which if completed, might convince the FTC that surreptitious product placements are against current law. In essence, somebody would have to show that product placements are effective -- that they cause people to believe something favorable about the products. Since advertisers spend millions on the assumption that this is true, and the advertisers are no dummies, I suspect such research should be feasible to do. I gave the School Nutrition Association a hard time for advertising Kellogg's Poptarts to school nutrition program administrators at the same as it was asking Congress for additional money for nutrition education in schools. At first glance, you might think the association's more recent update [note -- link seems to be broken on the SNA website] has a better choice of advertisement -- from a purveyor of supposedly healthier "light" breakfast meats. I followed the link to Jones light sausages and patties, but couldn't find any nutrition information to corroborate the term "light." So I looked further afield. According to the Center for Science in the Public Interest's review of breakfast meats, Jones Sausages -- advertised as a light product -- get 74 percent of their calories from fat and have 280 grams of sodium. The CSPI article lists other products that are better healthy options for breakfast meats. Why doesn't the School Nutrition Association put those products on its website? Is it because they sway in whatever direction the advertising money blows? Being trained as an economist, I have had it pounded into my brain that private businesses will be what they are, and it is often all for the best -- certainly it is often better than government intervention. But the flip side of letting the market work is that it is up to people in the private sector -- people like you and me -- to speak up for ourselves when we get outraged by this kind of hypocrisy. I'm not telling Jones to stop advertising their product. I'm telling the School Nutrition Association to stop pretending to have our children's interests at heart, even a little, at the same time as it is resisting efforts to promote better school meals and simultaneously takes money to advertise junk food and fake health food to school nutrition administrators. Get these ads off your website or people will truly have reason to mistrust you. A couple years ago, Secretary of Health and Human Services Tommy Thompson headlined the rollout of a new advertising effort recommending "small steps" to end obesity. This drew some derision from the nutrition community, which was well aware that it would take big steps to make a difference. Major economic forces -- among them food manufacturers, restaurant chains, automobile makers, real estate developers, and the entertainment industry -- have strong financial interests in maintaining various aspects of the status quo. No single one of these industries or sectors deserves the blame for our nation's obesity epidemic, but together, many of their products and services (and the ways they are marketed) have contributed to Americans' unhealthy lifestyle. Each of these groups has political clout that it can bring to bear on government officials to oppose policy changes that are against its own interests. That is one reason why many obesity experts believe it will take determined, well-organized efforts by concerned citizens and advocacy groups to bring about health-promoting change in our communities and our nation. Those don't sound like small steps to me. McDonald's healthy eating ads called "an odd fit"
A lot of suits in the executive suite at McDonald's world headquarters must be lying awake long into the night wondering how to deal with the healthy eating and obesity issues that collectively have been a large thorn in the side of McDonald's. If nothing else, the initial six commercials, tied to the awkwardly stated, difficult to fathom theme -- "It's what I eat and what I do ... I'm lovin' it" -- suggest McDonald's is pushing too hard to position itself as a health-conscious company, a claim that comes off a bit disingenuous. If you doubt that last editorial comment, you may be interested in this easy-to-use fast food nutrition information data base, which I recently noticed on the Washington Post website. Try it yourself. My family stopped off at a McDonald's while traveling late by car a week ago -- perhaps the fourth time my two- and four-year-olds had eaten there. You should have seen their delight in seeing a life-sized statue of Ronald McDonald. They immediately left my hands and walked over to stare beatifically into his face. Three thoughts: 1) Thanks, McDonald's, for the inexpensive and palatable junk food on a harried night when it was just what we needed; and 2) thanks for your completely immobile clown's surprisingly potent moment of entertainment; but 3) it makes me more sure than ever that your clown's nutrition talks in schools are really about selling cheeseburgers. I can't believe any school officials anywhere are falling for this. Food stamp participants generally spend their food stamps quite rapidly after they arrive each month. There is some evidence that some food stamp participants end up with less actual food intake in the second half of the food stamp month. I measured these monthly cycles for the first time using national level data in my dissertation several years ago, and reported the main results in an article with Christine Ranney in the American Journal of Agricultural Economics. Later, Margaret Andrews and I studied the spending cycle (but not the intake cycle) further using data from the Electronic Benefit Transfer (EBT) cards that have replaced traditional food stamp coupons, in an article for the Journal of Consumer Affairs. This topic has received renewed attention from economists recently, especially with a new article by Jesse Shapiro in the leading Journal of Public Economics. Shapiro uses the same food intake and EBT data that Margaret, Christine, and I used, and connects the food stamp cycle to recent theoretical work in economics about the role of extremely impatient behavior -- quasi-hyperbolic discounting -- which is inconsistent with the traditional theory called the permanent income hypothesis. A novel part of Shapiro's article corroborates the possibility of extreme impatience using data from questions about time preferences, which were asked of food stamp participants in Maryland. I think Margaret Andrews, who oversaw that Marlyand project for USDA/FNS, was the clever mind behind including these questions in a food stamp study. For example, some of these questions are: "Now suppose you had a choice between getting $50 in cash 1 week from today, or getting less than $50 today. Would you take less than $50 to get the money today? What is the smallest amount of cash you would take today rather than getting the $50 1 week from today?" Shapiro has a neat table showing how the impatience increases in the last 7 days of the food stamp month. There is some reason to worry that the monthly food stamp cycle leads to hunger at the end of the month, after food stamp benefits run out, even for families that in principle should have enough food resources on average. Knowing that there was enough food "on average" this month may provide little comfort to a family on the day or two that it is most hungry. Shapiro quotes one of my favorite passages from an earlier report by Mathematica Policy Research, in which food stamp participants in focus groups suggest that benefits should be distributed twice each month instead of all at once. Give it to us in two installments. At the end of the month I'm dying [for money]. If you got it on the 1st and 15th, or whatever, it would be so much better. Checks or coupons, it doesn't matter, either way, but it does not last a month. The second part of the month is always a struggle. With EBT, it should be fairly inexpensive to deliver benefits on this type of schedule. Is this done in any states, and if not, why not? The Agitator offers a thoughtful word of warning about overly heavy-handed nutrition interventions in children and youth, remembering that these age groups suffer from both high risk of overweight and high risk of eating disorders driven by weight-related insecurities. New York, Arkansas, and a host of other states are considering ridiculously invasive measures like weighing kids every day, and sending home "fitness" report cards that grade a kid's weight, body fat, diet, and/or activity levels. They're getting heaps of praise from the fat nannies for their "proactivity." In contrast with the Agitator, though, I would say that any national epidemic is the government's concern -- his strongest point is that this concern must be addressed with some care to ensure that the cure is better than the disease. On March 17th, Dr. Christina D. Economos, a Friedman School of Nutrition Science and Policy researcher who has received grants from the National Institutes of Health and Centers for Disease Control to address childhood nutrition and obesity, will be officially appointed to the New Balance Chair in Childhood Nutrition. The installation ceremony begins at 4:00 p.m. in the Behrakis Auditorium of the Jaharis Center on the Boston campus. A 1996 graduate of the Friedman School, Economos also is the associate director of the John Hancock Center for Physical Activity and Nutrition at Tufts. The chair is part of a $5 million gift over the next 10 years from the New Balance Foundation, the charitable arm of the New Balance athletic shoe company. The foundation has partnered with the Friedman School to create a far-reaching initiative to combat childhood obesity and improve the long-term health of future generations. However, Phil Lempert, the food editor of the "Today" show on NBC, saw it another way. "It appears they're throwing a lot of disparate ideas against the wall," Mr. Lempert said, "hoping one of them will work." And Peter Golder, an associate professor of marketing at the Stern School of Business of New York University, said he thought the campaign was "hiding from the name 'pork,' " which "itself suggests some of pork's attributes have negative associations they should work to address." The timing of the new ad campaign is complicated by the fact that the U.S. Supreme Court is expected to issue a ruling soon on the constitutionality of national commodity checkoffs like the pork and beef checkoffs. (Question: Is the industry promising payment of any funds that it does not yet have in hand, as a way of making commitments that will have to be honored even if the mandatory assessments are declared unconstitutional?). Your government's "government speech" seems at times to push high-meat low-carb diets that its best scientific experts criticize. It's enough to make me feel like the kid who wore the wrong brand of tennis shoes. Few webloggers this week shared my reasonably sympathetic view of CSPI's renewed lawsuit about salt. Here's the Anti-idiotarian Rotweiller: "You'll Have to Drag the Shaker From My Cold, Dead Hands. LC Ricky sends us this story about a bunch of moronic busybodies demanding that the Gummint march into our kitchens and start regulating what we can eat as well." The Rotweiller also seems to be under the mistaken impression that CSPI is funded by tax dollars. Overlawyered gets the story more nearly correct, recognizing that the issue is whether FDA is correct to classify salt as "Generally Recognized as Safe." Overlawyered describes CSPI as "a prominent busybody group" and exaggerates the remedy sought by CSPI: "[the suit demands] that food preparers be made to obtain permission from federal regulators before adding salt to food." A Stitch in Haste recognizes that CSPI is not really advocating banning of salt, but rather is concerned especially about salt in fast food restaurant food, where the levels of salt are frequently extremely high and are less clearly an expression of consumer choice. Still, the weblogger says, "But do not try to regulate us. We are adults and do not want you, or the FDA, telling us what to eat." Brian J. Noggle doesn't like the lawsuit either. "What's next? Moving Morton's over the counter, limiting me to three cartons at a purchase, and putting my name in the database of users?" Logical Meme says, "If CSPI makes any headway on this, it will be another drift toward an Orwellian state-citizen relationship." The weblogger has interesting favorable comments with regard to government education efforts to inform people about the dangers of salt, but adds, "But the state has no right to make it illegal." Of course, neither CSPI nor anybody else has asked for such a thing. I encourage anybody who made it back here by way of trackback to take a second look at CSPI's actual lawsuit. Consider the advocacy group's patience in waiting 20 years for FDA to deliver on promises the agency made about a review of an additive that its own experts recognized as not generally recognized as safe. Consider the mild and reasonable remedy requested by CSPI, and consider the severity of the public health issue at stake here. Is there no middle ground in between the Orwellian state and the do-nothing option of relegating another generation to the same rates of death from blood pressure and stroke? [Update 3/7/05: Corrected Noggle link]. University of California-Davis nutritionist Lindsay Allen says reporters "hyped" her concerns, when she was quoted at the February meeting of the American Association for the Advancement of Science as saying, "It's unethical for parents to bring up their children as strict vegans." Allen says strict vegetarian diets are unethical, unless "missing nutrients" are added "through supplements or fortified foods." Allen's research with Kenyan children found that their development improved when their nutrient-deficient diets were supplemented with meat or milk. Her research was partially funded by the National Cattlemen's Beef Association, and its publication supported by the Food and Agriculture Organization, Land O'Lakes, Heifer International, and Pond Dynamics and Aquaculture-CRSP.